The International Monetary Fund (IMF), on Monday 24th March, officially opened its fifth Africa regional technical assistance centre (AFRITAC) in Ghana, offering capacity building services to six countries across Western Africa. This fulfills the IMF’s commitment to extend the AFRITAC network to serve all Sub-Saharan African countries. The new centre is in line with a commitment made in 2002 with the IMF Capacity Building Initiative for Africa. “This is an important day for capacity building in Africa,” the IMF’s Africa Department Director – Antoinette Sayeh told donors, delegates, and staff at the opening ceremony in Accra. “The IMF launched this initiative with a vision: give access to all countries in sub-Saharan Africa to an IMF regional technical assistance centre”, she added, noting that this vision was a response to African heads of state, who realized the continent needed centres of capacity-building excellence on the ground in the face of mounting challenges. “Today, this vision is implemented,” she said. The new centre, located in Accra, became operational on January 13, 2014. It serves Ghana, Cabo Verde, Liberia, Nigeria, Sierra Leone, and The Gambia. It complements four existing AFRITACs: AFRITAC East opened in 2002 in Dar es Salaam, Tanzania; AFRITAC West 1 opened in 2003 in Abidjan, Cote d’Ivoire; AFRITAC Central, opened in 2007 in Libreville, Gabon; and AFRITAC South opened in 2011 in Port-Louis, Mauritius. The five centres cover all sub-Saharan African countries. The centre is led by a coordinator and is guided by a steering committee whose members represent the beneficiary countries, donors and the IMF. Ms. Sayeh recognized the contributions to AFRITAC West 2 from Ghana, the host country; the donors, including Australia, Canada, China, the European Union, Switzerland, the African Development Bank and the European Investment Bank; and the IMF. She noted, however, that member countries other than Ghana were also expected to financially contribute to the running of centre, and was hopeful that their contributions would be forthcoming, as they learn more about the benefits of the centre. Knighted by her country for her service in building Liberia’s financial institutions and international credibility from the ground up following a destructive civil war, Antoinette M. Sayeh, who joined the IMF in 2008, has turned her energy and enthusiasm to leading the African Department at a critical time for the Fund and for the nations of Africa. 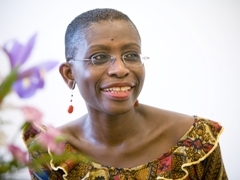 Born in Liberia, educated in Liberia, Switzerland, and the United States, she spent most of her professional career at the World Bank because – among other things – a devastating civil war in her native country precluded working back home. A DC-based career as an economist at the World Bank followed. The lengthy war in Liberia ended in 2003. A landmark 2005 election put the first democratically elected female head-of-state in Africa in charge of the fractured country. As President Sirleaf considered the massive challenge to rebuild a ravaged national psyche and a destroyed economy—broken roads, no electricity, little government or private sector capacity and a crushing $3.7 billion debt, she turned to Sayeh. Today, Sayeh says it was a move she had to make. “You cannot pass up an opportunity like this, to make a true difference in the future of your country,” she explains. In a whirlwind two-and-a-half years on the job, Ms. Sayeh oversaw a series of reforms that have set her still-fragile country on a stronger path. Among her successes: significant revenue expansion and progress on expenditure management, adherence to a balanced cash-based budget and economic governance reforms. Perhaps most significant: she spearheaded the drive toward clearance of Liberia’s protracted arrears to the IMF, World Bank and the African Development Bank, as well as the restructuring of the nation’s bilateral debt, making it possible for the country to access much needed new external sources of finance—including a PRGF facility from the IMF.